Provide comfort for the family of Jean Brooks with a meaningful gesture of sympathy. Jean A. Gelbhar was born on Flag Day, June 14, 1963, to Johnny Gelbhar and Jean Nyquist Gelbhar in San Marcos, Texas. 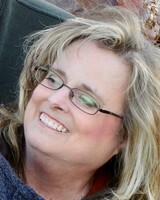 Jean “Jeannie” passed away at the age of 55 on March 25, 2019 at Texas Health Arlington Memorial Hospital in Arlington due to complications after surgery. Jeannie was the eldest of the three Gelbhar girls and as a child of an Air Force officer, lived in many interesting places like Newfoundland as a child and Hawaii as a high schooler before making her way to College Station, Texas to attend Texas A&M University. Jeannie was a loving and caring wife, mother, coworker and friend. She was a very special woman that never fully realized how many lives she touched during her life. Jean was a proud graduate of Mililani High in Oahu, Hawaii in 1981. Jean attended Texas A&M where she met the love of her life, Chris Brooks, at a dorm mixer in 1983. After graduating from A&M in 1985 with a business degree, Jean and Chris were married on September 7, 1985 in Seguin, Texas. She joined Chris in Arlington, Texas to begin their lives together. During her working career, Jean worked in the Mortgage and Title businesses, building life-long friendships with her co-workers. Jean was diagnosed with scleroderma and several other autoimmune diseases in the late 1980’s. She was told that she would probably be unable to have children at that time and was overjoyed upon learning of her pregnancy in 1990. God blessed us when Jean gave birth to Kristen Brooks, on July 20, 1990. Kristen was a 26-week-old preemie and Jeannie stayed by her side for 111 days until she could bring her home. Jean faced many health-related challenges throughout most of her adult life, including several near-death events. Through it all, it was her love of family that always drove her recovery and affected everything she did. During the recent event that took Jean from us, she fought to the end until the Lord called her home. Jean lived in significant pain and rarely complained about it – she was happy to be alive for her immediate and extended families and friends. Her motto was “If this is the worst thing that happens to me today, it’s been a good day.” Jeannie was a truly selfless person and was our family’s rock. She was dearly loved and will be deeply missed. Jeannie loved watching Kristen dance and perform in theater productions, watching Aggie sports, seeing her nieces’ run track and play volleyball and spending time texting her dad about the Texas Rangers’ games. She loved making scrapbooks for loved ones to document important events in our lives. Jeannie loved living in Hawaii and Aggieland; these places provided her with many happy memories. Jean is survived by her husband, Chris and daughter, Kristen. Other survivors include her father and mother, Johnny and Jean Gelbhar, her sisters, Linda Rae Takenaka and her husband George and Cheryl Anne Heins and her husband, Mike. Jeannie was blessed with eight nieces and nephews (Justin, Kelsey, Alexandria (Alex), Travis, Ashley, Kevin, Mathew and Alex), whom she loved dearly. A memorial celebration will be held for Jean on April 26 at 10:00 am at First Baptist Church Arlington in Arlington, Texas. In lieu of flowers, memorial contributions may be made to: Mission Arlington (missionarlington.org/financial-support/ 817-704-6141) The Scleroderma Research Foundation (srfcure.org/donate/ 415- 834-9444), The ALS Association (www.alsa.org/research/ 888-949-2577) offered in support of Jean’s cousin Brita. To send flowers in memory of Jean Aline Brooks, please visit our Heartfelt Sympathies Store.